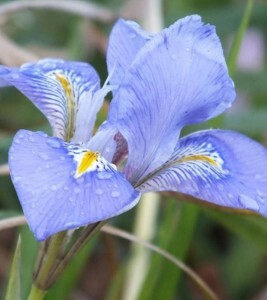 Unusual Iris, as it flowers in winter from December onwards. It is a rhizomatous or bulbous perennial with narrow leaves to 30 cm in height. It has very fragrant flowers, deep violet marked with white and yellow at the base. Maybe it’s worth collecting seed from this Iris for plant breeding. Looking for different colours, flower size etc. For developing your new plant breeding selection or new plant discovery I can offer full training and new plant development service. More details are available on my website. Now the weather has changed to colder conditions the clocks have changed, we had the first frosts of the season, December has started quite wet and windy, having just gone through storm Dierdie, with strong winds and heavy rain the weather has now turned milder, looks like this will be the pattern over Christmas, with a colder spell for January. Raise these up on pot feet or bricks to improve drainage. Planting tulip bulbs, Daffodils, try some in tubs and patio plants mixed in with bedding to give early colour, still time to do this. Continue to trim back and tidy garden, clearing weeds, while weather is open lift, divide and move perennials. Tidy and remove any fallen leaves from borders add them to your compost heap. Good time still to move shrubs and trees if needed. Now is a good time to carry out soil improvement works by adding compost , good to add also bark to heavy clay soils to improve drainage, frost will help break down soil. Bring in any tender plants if not already done so, put in greenhouse or conservatory. Continue mulching borders when its not frosty or snow on the ground. Avoid walking on lawn when frosty. If you have a pond, put some net across to stop herons stealing your fish. Break ice on the pond by holding a saucepan of hot water on it until it melts through. In the Greenhouse, finish cleaning. Poinsettia are available now keep in a warm draught free room, don’t buy from outside stalls, keep protected when transporting home. For vegetables there is still time to plant broad beans, Garlic, and spring cabbage plants if you can find them, look in local garden centre. Clean tools and drain any petrol out of any power tools you will not use over the winter. During these dark days, its is a good idea to get out those seed and plant catalogues and start planning for next year. Check through the seed you have collected, see if any plant breeding projects spring to mind. Enjoy the garden, Merry Christmas, and a Happy New Year to you all, see you next year. This series of Anemone is bred by Mr. Yoshihiro Kanazawa of Japan, this series of Anemone features four pink forms and one pure white, ‘Pretty Lady Julia’ has double flowers. All in the series have good compact habits, 40cm high and 60cm spread, fully garden hardy they make ideal border plants for today’s smaller gardens also good for containers and patio. Flower from August until October. So when selecting subjects for plant breeding it’s important to select for colour and height and also take into account today’s market trends in plants. You see with the Anemone, by getting a shorter flowering plant it makes the plant more fitting for todays market and also for growers more plants can be transported on a lorry in flower as its shorter so it’s a good growers plant. Keep records of any crossings you make. Be critical when making a selection, be prepared to be strict when discarding plants. Also pictures can be taken and stored if needed. have been quite low down to around 7°centigrade and lower in some places here in UK. You will still need to keep all baskets and tubs watered and checked each day. Perennials dying down or fading can be trimmed back to encourage growth before the winter. Continue to take semi-ripe cuttings now. Look out for Vine Weevil damage, damage shows when plants start to wilt, on inspection roots will have been badly eaten you may also see white c shaped larvae, apply a biological control, plants in containers are unlikely to recover. Prune climbing roses once flowering is finished. If you have a pond then keep water circulating, using waterfalls and pumps, fountains etc. In the Greenhouse, open greenhouse and increase ventilation on sunny days, extra shading like shade paint applied to outside may be needed during hot periods, don’t let greenhouse get to hot. You should be having some good tomatoes and cucumbers now. Take time to relax in garden at some time each day while it’s still light evenings for barbecues and generally enjoying the fruits of you hard work. Primula Tortoise Shell unusual form of Primula (polyanthus type with double flowers from now until early summer, good for borders and containers. This plant was selected and bred by Daphne Lloyd and Norman Draper of the UK. It was brought to me for trials a few years ago from their plant breeding and selection. Now is the time to be busy with seed sowing of seed from your plant breeding projects, for developing your new plant breeding selection or new plant discovery I can offer full trialling and new plant development service more details available on my website. It look like spring may finally be here with temperature forecast to rise although still having rain. Most trees and shrubs are now budding up, looks like frost has passed for now. Will April be full of April showers or drought! Hardy annuals can be sown now, can sow direct into borders to fill gaps. Many hardy perennials can still be sown now, sow into plugs or small pots. 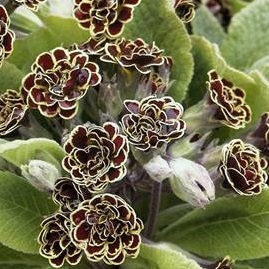 Instant colour can be provide by planting Primula and Viola, look for cornuta types. Put bedding plants outside during daytime on fine days, but bring them in at night this harden them up plants will get a better start. Regular watering of containers is needed now, feed also will help get things underway. Too early for summer bedding, but you can plant up tubs and baskets if you have a frost free area. can be divided and weeds removed. Divide those clumps of perennials like Hosta’s, Hemerocallis, this will invigorate and improve plants, every three years or so. For cut flowers you can plant up Delphiniums and annuals. Prune Lavenders to new shoots. Deadhead Pansies, Viola and Primula. Clean up winter bedding that has not survived remove self-seeded forget-me-nots so they do not take over other plants. Evergreens in cooler areas you can still move evergreen shrubs but it is getting late now and watering could be difficult as season progresses. Much roses with organic matter. Cut back Salix and Cornus. Remove frost damaged shoots from evergreens. Take cuttings of your favourite conifers. If you have newly planted trees you will need to put on guards to protect against rabbit damage. Mow lawn regularly now, keep to an even height throughout season. Alternatively rake or scarify lawn to remove moss. is the only control available to amateur gardener. If you have a pond start using water filters now, fish will be starting to be active don’t overfeed. Continue tidying marginal and bog plants. In the greenhouse prick out seedlings, space out plants, check watering every few days. The greenhouse will need venting each day now when weather is warm, you may need light shading on bright days. R=Temperatures can droop at night you may still need the greenhouse heater or other protection. On warm days damp down greenhouse floor helps to control red spider mite. House plants can begin feeding now, check watering every few days. Wipe clean shiny leaved plants with damp cloth. In the veg garden winter sown broad beans and peas will be in active growth now, peas will need support, twiggy sticks are ideal. Keep on top of weeding whenever conditions allow. Continue sowing vegetable seeds now for succession of crops. Any seed for march can still be sown in April. Sow, Beetroot, leaks, carrots, lettuce, cabbage etc. Under glass sow, cucumbers, pumpkins, tomatoes, peppers. In sheltered areas make fist sowing of French beans. Sweet corn can be sown now use a peat pot so you can plant direct in garden later. Strawberries and Raspberries will be starting to grow now, feed with a tomato feed, not a high nitrogen feed. Time to get out the barbecue and garden furniture ready to enjoy the long summer days. Take time to walk round garden each day – enjoy. March is well here now, and officially spring has started, but last week you would not have guessed with heavy snowfall and temperatures below freezing during the day. But that has gone now and today the temperature is 9°c and raining! I see many plants starting to grow, Delphiniums, Primula, Lonicera is coming into bud, and Crocus still in flower seems unaffected by the cold weather and snow. 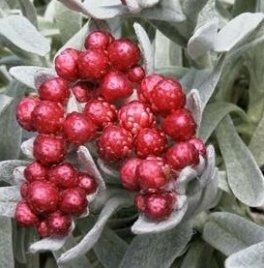 One early flowering plant that will be coming into bud and flowering towards the end of the month is Helichrysum Ruby Cluster, grey foliage woody stemmed plant with dark red flowers, its is a plant that likes free draining soil the plant is quite hardy but dislikes winter wet. This Helichrysum is available in other varieties and colours, Pink Sapphire, Amber Cluster, Emberglow, they are all from UK Plant Breeder – Chris Bowyer based in the North midlands. So it if you have a plant breeding project underway and are looking for advice, assistance in developing your new plant commercially then I can be of service, more information is available on my website. 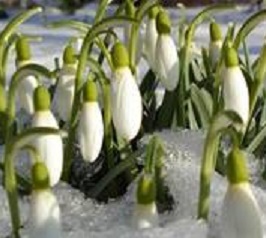 Will March be full of spring cheer of will winter return for another bite!! Finish clearing the last of leaves and winter debris. Still time to finish cutting back and trimming grasses. If you have overwinter Fuchsia, prune back to one or two buds on each shoot. Pruning early flowering Clematis once their flowers have finished and summer flowering Clematis before growth starts. Prune bush and climbing roses, add some fertilizer to base, look for specialist rose fertilizer. Plant new roses either bare-root or container, do not though plant where you have had roses before. Trips to your local retail nursery or garden centre will find many plants starting to arrive for planting, still too early for spring bedding though, don’t be tempted to plant outside yet! You can sow and plant hardy annuals. Good time to plant snowdrops in the green brighten up garden next year. You can start planning the new beds you prepared last month. Time to revitalise established plants in containers, remove top 5cm of compost and replace with new add some all season slow release fertiliser. Containers will need regular watering now. If you have Dahlia tubers you can start them now, place in pots or trays and cover only the tubers with compost, water, keep frost free, you can take cuttings from the new shoots if you need more plants. For a good display of spring bulbs next year you can remove spent flowers and seed heads, leave leaves for now. Keep an eye now for slugs and snails use your usual method. Lift and divide and perennials that you want to revitalise, move or create more plants. You can take basal cuttings of perennials that are showing new growth. Seed sowing is well underway now, look for some new varieties to try. Cut back Cornus (dogwood) and Salix (willow) grown for coloured stems in winter. Where possible start regular hoeing of weed seedling as you see them it will help later in the season to keep on top of them now. Now is a good time to lay new turf, work from planks, do not walk over it for several weeks, you will need to water it during dry periods, first cut should be on the highest setting. Established lawns can be cut now if needed and weather allows, don’t mow if frosty or if frost is forecast. The first cut of the season should be light, keep blades 1cm above usual height. Good time to get blades sharpened and mower serviced if you did not get it done last month. Later in the month you can apply a spring fertilizer that is high in nitrogen this will help the lawn recover from winter. Any bare patches, fork over and loosen soil then apply some fresh grass seed, keep watered, may have to protect from birds. Neaten edges with a turf iron, it will make lawn borders look a lot better. Work from a board if it’s wet. For ponds you can start feeding fish now, give a little but often. Check, repair or replace pumps and filters. Tidy up plants in bog garden add new plants if required. In the veg garden you can start chitting early potatoes for planting later in month, plant shallots, onions and garlic. Dig in some green manure or compost to improve soil. Prepare seed beds for planting and you can start sowing , carrots, radishes and lettuce under cloches for early crops. Continue to plant fruit trees and raspberry canes, autumn fruiting canes should be cut back to ground to encourage new canes to develop. Summer fruiting cut back to top of supports to a bud. In the greenhouse you can start sowing winter greens. Sow tomatoes in a heated greenhouse. Start sowing bedding plants ready planting after the last frost. Repot house plants and orchids before they start active growth. Carry out repairs to pathways. Clean algae and slime from patio and fences several products are available that will assist with this, just ensure that it is safe for plants and pets. When planting in garden consider using a mycorrhizal fungi product like Rootgrow™ it helps with plant establishing. Take time to walk round garden each day. February is here and already the days are noticeably longer. Snowdrops are up and out in my garden a sign of spring amongst the recent snow. This can be quite a cold month wet or snow, and as I write the weather forecast for the coming week is for cold weather with frost at night and maybe some snow. You can start Dahlia tubers now in a light warm place, maybe you have a new cultivar to try out, you can find further advice about how to develop you plant breeding lines on my website. Sow those perennials this month, the cold weather will help stratify seed. February fill dyke black or white! February can be a month of heavy rain and some winters snow, the phrase refers to ditches being filled with water or snow! Snowdrops and Crocus will be up now. Carry on clearing branches and twigs from recent storms, good idea to check fences and property borders for damage. Trimming and tidying of perennials and grasses can continue while weather allows, trim dead leaves off Hellebores shows up flowers better. 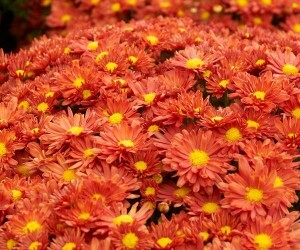 If you have winter bedding, deadheading and removing dead leaves will prolong flowering and keep plants looking good. You can divide perennials now those that have overgrown their allotted space and those you want to move, such as Geraniums. Prepare beds for new planting such as roses, but remember do not plant Roses in the same area as previously planted. Improve beds where you have poor drainage by digging in gravel and organic material now is the time for soil improvement when weather conditions allow. Weeding of borders can also be carried out as these will continue to grow. Plant Lilly bulbs in pots for summer flowers. Dahlias and Cannas stored check for drying out and any disease, remove those that have rotted. Good time to look through catalogues and order seed. Last chance to take hardwood cuttings of ornamental shrubs like Cornus, Ribes, Salix. For lawns you can lay turf and repair lawn where required but avoid wet or freezing weather. If the lawn needs mowing cut to maximum height to give a tidy up, edging the lawn will give a nice neat finish. Good time to get mower serviced, check tools and sharpen where needed. Late summer and autumn flowering Clematis can be cut back to lowest pair of strong buds. You can trim winter flowering Heathers as flowers fade to keep bushy habit. Last chance this month for pruning apple and pear trees. Time to cut back autumn flowering Raspberries and black currents to encourage new canes. Not a lot to do with the pond if you have one keep from freezing completely. Look at storing more water for watering your plants during dry months by installing more water butts. Mulching is also worth considering best for next month. If you have alpine plants then some gravel round crown helps with drainage. January can be a bleak month, still shortage of daylight and as I write we have just had some very wet days. Thinking of New Plants and breeding now is the time to start sowing perennials, the cold weather will help stratify seed aiding germination as the days get longer and temperature start to rise. 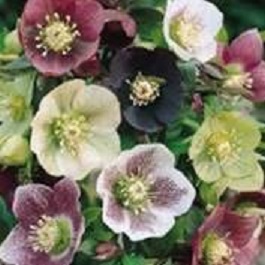 Helleborus will soon be flowering, I have seen some in flower already, look for some interesting colours, double flowers for new cultivars or hybrids. If you have breeding lines and are thinking of how you can develop them further I can assist you with any trialling that is needed. Further advice can be found on my website. With recent storms there may be branches and leaves to clear from the garden, these can be trimmed up and burnt, composted or taken to local recycle centre. Carry on trimming back perennials and tidying garden beds. Can still take root cuttings and seed sowing of perennials, shrubs etc can be carried out now, either in greenhouse or outside. You may need to protect seed trays from vermin. Cover with wire netting is ideal. Plant lily bulbs and check Dahlia and Canna tubers for drying out and mould, remove any that are rotting. During freezing weather winter bedding such as Viola, wallflowers can lift slightly from soil, go round beds and firm gently back in. In the veg patch you can cover some bare soil with clear polythene or cloches to warn soil ready for early sowing in March. Remove any weeds that appear. Still time to plant Garlic, I received some bulbs this week and will plant as soon as frost has lifted. When lawn is not frozen or waterlogged cut lawn edges to improve appearance of garden, you may also need to give lawn a light trim once if month is mild. Remove any leaves and debris remaining. Aerate the lawn to improve any wet areas. Remember don’t walk over the lawn during frosty weather. Remove any leaves from pond, melt a hole in ice with hot saucepan, check water levels, take advantage of any sales on for aquatic plants and pumps filters etc. Move any shrubs, tress and plant new ones. Pressure wash pathways to prevent algae, clean drains, check pipes, taps for damage from frost lag or drain if needed. Hippeastrum bulbs need to be brought into active growth by watering and feeding, looking for flowering in late winter to early spring. Check and clean gutting and down pipes, clean down pipe filters. Now is good time to take some time to look at your garden and consider new projects, plants to add, things to change. 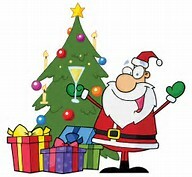 Now is the time to think of log fires and presents round the tree. But there is still time to think of gardening and plants. Now is the time to look through the seed and plant catalogues for new and interesting plants and plan for new plantings next year. From seed of course you can get new and interesting plants and also think of interesting crossings and plant breeding projects for the new season. If you have a new plant and want further advice, my contact details and further advice can be found on my website. Trimming of deciduous trees and shrubs can be carried out now but avoid doing during very frosty weather. Hardy salads can sown undercover. This time of the year I like the colour of the leaves on the trees, working in the garden can be rewarding doing plant breeding, clearing leaves and pruning deciduous shrubs, trimming back perennials and collecting those final seeds. In the garden there are still jobs to do, continue with leaf clearing, consider composting in your garden if you have the space. A simple compost area can be created using wire netting and posts the cheaper ones are the ones used as tree stakes. It’s time to sow Broad Beans and peas, look for Broad Bean Aquadulce Claudia ideal for winter sowing and Pea Meteor Dwarf ideal for winter or early sowing. Both will need some protection from birds when germinating and also cover during periods of severe weather. Look out for Must Have Perennials™, I regularly work for them and their breeders. Must Have Perennial™ varieties are tested at the famous Bressingham Gardens, as well as other secure trial sites worldwide. 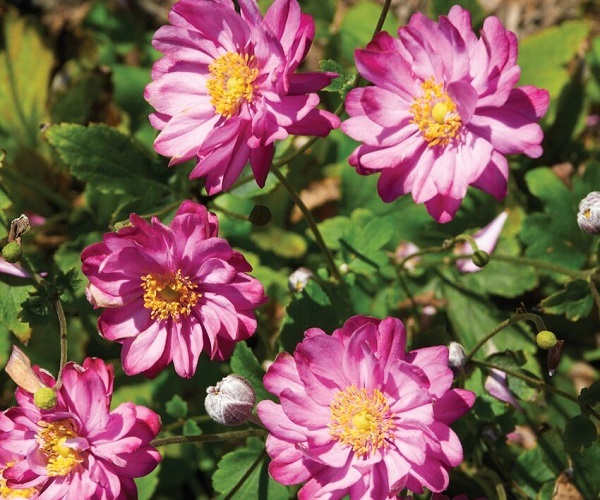 Must Have Perennials™ varieties come to us from people around the world, ranging from professional plant breeders and breeding companies to eagle-eyed amateur gardeners. Many varieties have been recognized by independent organizations for their outstanding qualities. Also Geranium Rozanne® – this an excellent Geranium that flowers from June to first frost, Rozanne has a website geraniumrozanne.com also follow on twitter® and Facebook®. Paul Gooderham carried out the trialing and first propagation of Rozanne®, he also worked on the plant breeders rights and patents worldwide. A good place to see plants for winter interest is at Bressingham Gardens Norfolk.